As an oily skinned gal i'd always chosen oil free formulas and avoided the stuff like the plague because I wasn't going to add fuel to the fire and end up looking like a slick faced fool. However recently i've been all about the oil, i've realised there's a time and a place for it in my routine which of course is at night and my skin has been looking better than ever. 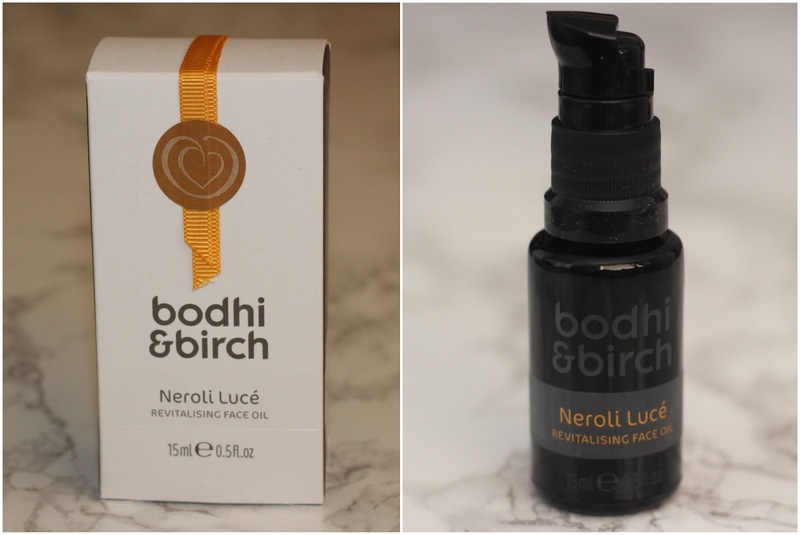 The Revitalise oil by Bodhi & Birch is designed to rebalance, rejuvenate and restore the skin using Tunisian Neroil, Frankincense and Sea Buckthorn oils, it's incredibly light and very quick to absorb so you don't look greasy all night if you're like me and enjoy removing your makeup the second you get home. It hydrates incredibly and makes the skin so radiant you can really notice a difference the morning after applying it which you can't often say with skincare as a lot of it takes time to see a noticeable difference. Longer term i've noticed scaring reduced and I have to say pores appear less noticeable however I think that's more to do with the fact my skin is so hydrated because i'm using the oil rather than a permanent correction. I'd never used a product from Bodhi & Birch before and along with this oil got their Mint Thé Bath & Shower Therapy; I have to say i'm very impressed. The whole ethos of the brand is eco-luxury and they don't disappoint with their formulas which are packed with traditional botanical remedies and modern western skincare and it is definitely worth mentioning that all their products are made in good old Blighty. At £32.00 for 15mls (Link) it's definitely not expensive for an oil but it's not going to be the cheapest product in your skincare routine but the quality of the ingredients and the results you see means it's likely going to be the most effective element in your skincare so worth the investment, and I have to say i'll be trying out more from the range because i've been very happy with the two products i've got (I'm seriously hankering after the Rosemary Chi Detox Salt Scrub) and it's always good to support British brands.